Welcome to the land of the Pixies as you venture into Pixie Wings! This stunning game is available for you to play now right here at Slot Games and was developed by industry-renowned Pragmatic Play. Like many of Pragmatic Play’s other games, they have ensured that this game is beautiful and clean. The animations of the Pixies and the background all run smoothly and add a nice little touch to make the game feel more alive. The symbols have also received the same care and attention as the background. Anyone who is familiar with slots may recognise the 10, J, Q, K, and A which have been chosen to represent the game’s lower paying symbols. Higher paying ones are four unique Pixie characters which have been designed for the game; a King, a Queen, a Prince, and a Princess all with their own special colour and characteristics. The game also includes a bonus scatter in the shape of a tree and a Wild emblazoned in the slot’s logo. Everything has been very highly designed and you will struggle to find a place not covered in the smallest of details while you play. Pragmatic Play like to place all the controls for their game in the ribbon at the foot of the screen. From here, you can choose whichever bet you like, select from the autoplay functions, view the paytable, or control any of the sound effects. Everything you need is right at your fingertips, allowing you full control all the time. Winning combinations are made whenever a certain number of matching symbols land on one of the game’s 50 paylines. You only need 2 Pixies for a winning combo but the lower paying symbols do need 3 to make a win. Pixie Wings is all about the free spins when it comes to the bonuses. To activate this amazing feature, you simply need 3 of the tree scatters. You will be given a selection of 5 options to pick from. Firstly, you can choose any of the Pixies. They each have their own number of free spins associated with them. The higher worth they have as a symbol, the lower number of spins they have. Therefore, the King has the least number of spins, at only 5, while the Princess has the highest with 11. By choosing one of the Pixies, you are causing their symbol to turn into a Stack across the reels. Having stacked symbols such as these are great for helping you to land big wins. Remember that there is a fifth option? If you choose this, you could get any of the Pixies or the Wild plus 3 to 12 bonus spins! With stacked Wilds or 12 King Spins on your hands, you are definitely in a good position to grab a great prize! The stacked symbols also appear in the base game so keep your eyes peeled! With Pixie Wings, a great win is always waiting where you least expect it. Pixie Wings thoroughly charmed us from start to finish. 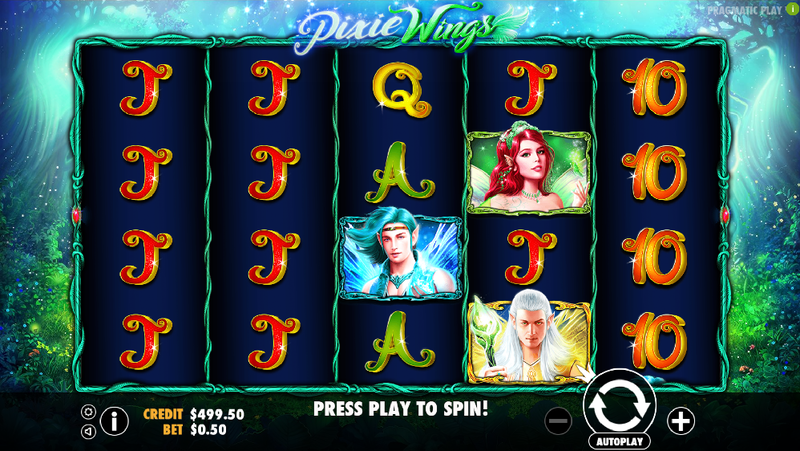 We wholeheartedly recommend this slot to any fairy fan looking for a new favourite game. This game has a great chance to win wrapped up in a beautiful setting; what more could anyone want?